Financial statement analysis is often useful for valuing a company’s stock. 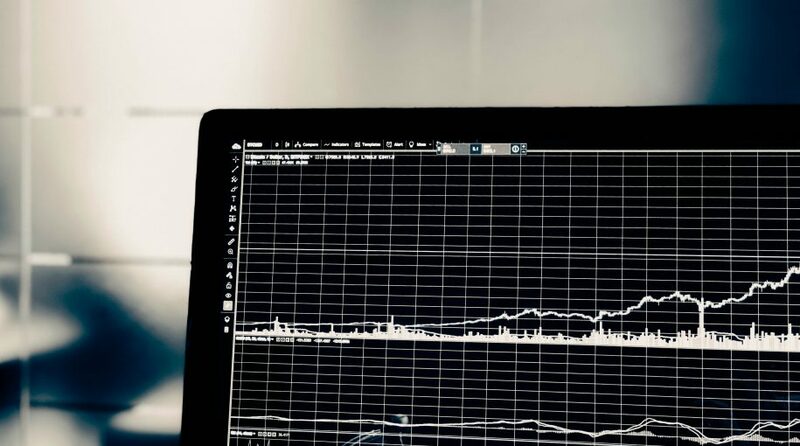 Using ratios such as price-to-earnings, price-to-sales or price-to-book, investors assess whether a stock is trading at a discount to its intrinsic value. However, these ratios aren’t the only way to assess a stock’s value. I believe that share buybacks can be another helpful tool — when a company’s management team reduces the number of shares outstanding, it is signaling to the market that a stock is trading inexpensively to its intrinsic value. Of course, as with any strategy, it’s important to understand the performance drivers of buyback strategies, so that you can anticipate when they may be poised to outperform or underperform. And the drivers of buyback strategy performance may be surprising to some investors. How are share buybacks different from traditional valuation measures? A management team’s assessment of a stock’s value has certain advantages over traditional financial statement analysis, in my view. Typically, management has a strong command of the prevailing competitive landscape, economic backdrop and industry trends affecting the firm. Because management has an information advantage, the decision to repurchase shares often implies that management sees the return potential from buying stock as advantageous to other uses of cash. In effect, management is telling investors that the stock is cheap. By extension, a buyback investment strategy assumes that management is reducing share count for good reason, which can prompt value investors to take action. A reduction in shares outstanding spreads profits over a smaller base, which tends to increase a company’s earnings per share — an important measure of profitability. Assuming a constant valuation multiple and no change in earnings, rising earnings per share can support equity prices, as stock prices tend to move in the direction of earnings and profits over time. Certain macro conditions favor buyback activity, as I’ll explain further below. For example, falling or low interest rates allow a company to borrow cheaply and repurchase its shares with the proceeds. Likewise, a slow economy that presents limited investment opportunities creates fewer investment options — increasing the likelihood of a share repurchase program. However, these conditions can sometimes cause investors to get too excited about a buyback theme, and they tend to expect outperformance during these environments. 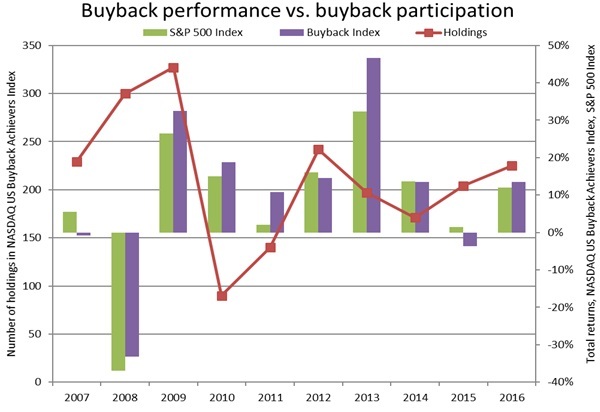 While economic conditions may affect the number of companies repurchasing shares, they don’t necessarily lead to higher returns for a buyback strategy. To illustrate this, consider the NASDAQ US Buyback Achievers Index, which selects stocks that have experienced a net reduction in shares outstanding of 5% or more over the trailing 12 months. In other words, the index includes companies that have been repurchasing shares. In the chart below, note that the number of companies included in the index was relatively high in 2008 and 2009 and low in 2010 and 2011, but the relationship between share buyback participation and excess returns was limited.